Hello My Pretties! (Yes, I recently watched the Wizard of Oz). I hope everyone had a wonderful 4th of July weekend. I must say, it’s great to go away on vacation, but it’s always good to come home. 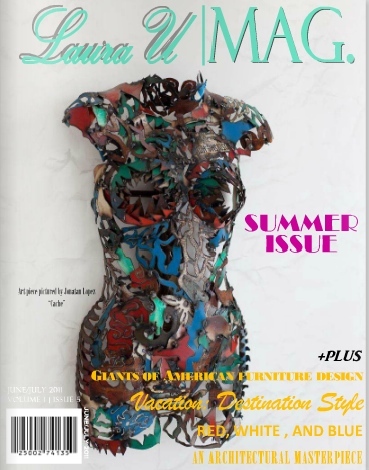 While I was away, this lovely little piece on one of my favorite places to travel to ran in the most recent edition of the online magazine Laura U (check out page 80). Stay tuned . . . lots of good stuff in store! 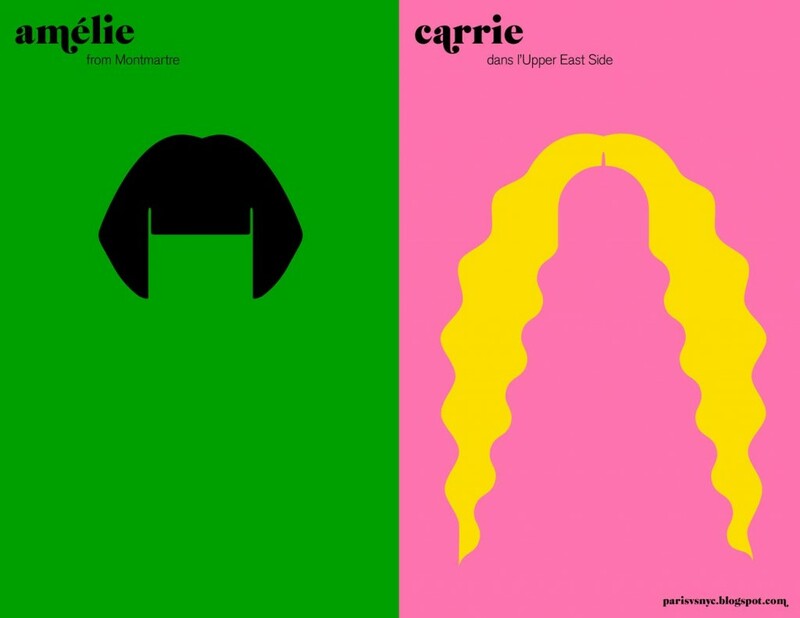 These posters do a great job of depicting my two favorite cities and make me smile every time I look at them, so I thought I’d share them with you dear readers. What do you think? So, you’ve been planning your trip to Paris in your head for at least the past 6 or 7 weeks now, right? 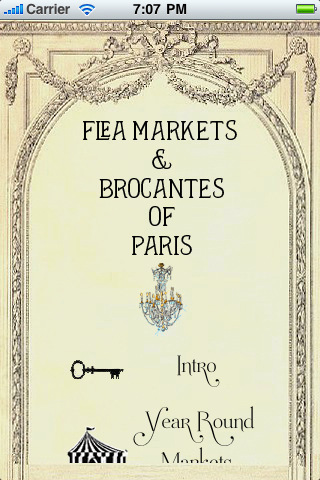 With visions of macarons, cafés and the flea market dancing in your head . 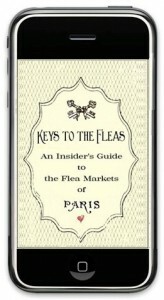 . . Now, all you need is the Keys to The Fleas iPhone app to make sure that you get the most bang for your buck while shopping in Paris! 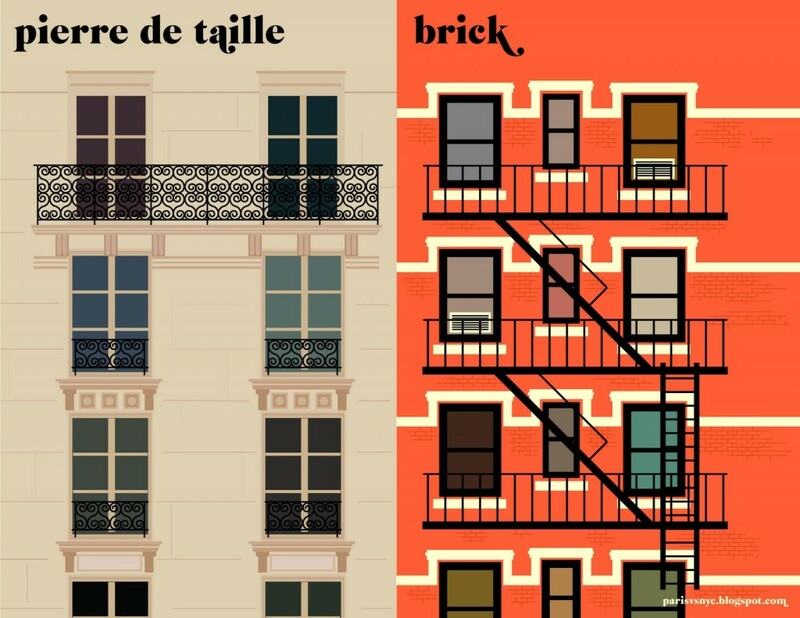 Claudia Strasser of The Paris Apartment, and creator of the Keys to The Fleas iPhone app, is going to give one of my lucky readers the Keys to The Fleas – pretty nifty, mais oui? Leave a comment below telling us why the Keys to The Fleas are a must for you and the winner will be announced next week! Adventures in Paris, IV: My Favorite Things . . . 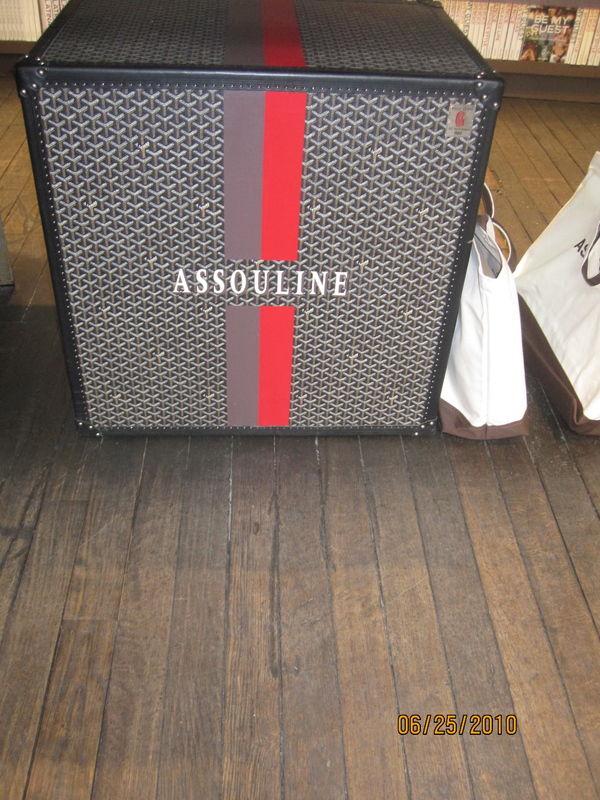 I loved the monogrammed Goyard trunk at the Assouline Store! 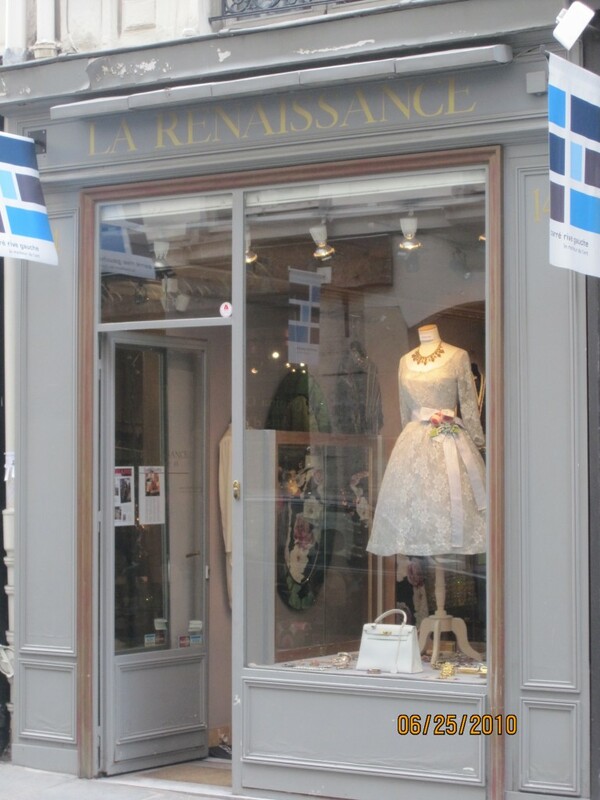 I stumbled upon this fabulous vintage boutique, La Renaissance, that I read about in Vogue years ago. Beautiful clothes - best part? The owner told me she liked my dress! I love the entryways for the Metro stations - they're soooo elegant! 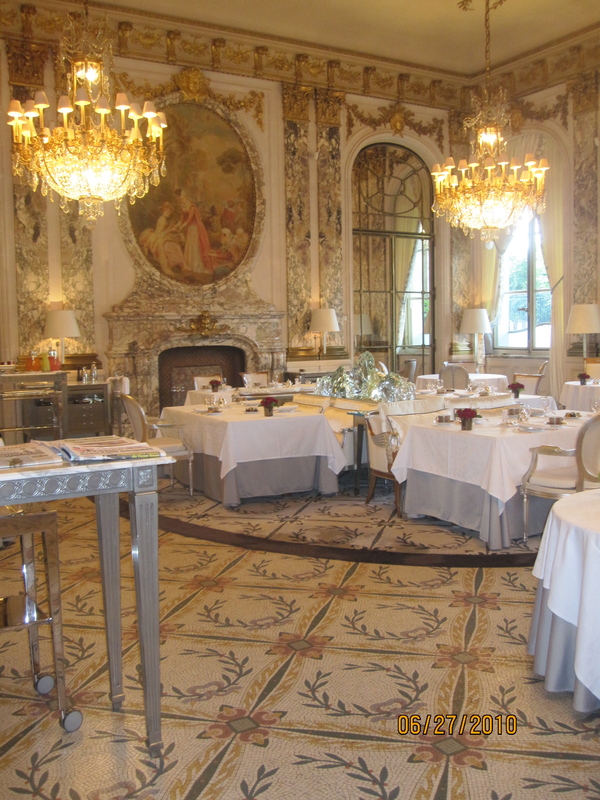 Restaurant Le Meurice at our hotel, Le Meurice - the food and service were to die for! I HEART Paris! I am so thankful to have had the chance to go and explore – it was an absolutely wonderful trip. Thank you for reliving the moments with me. Until next time . 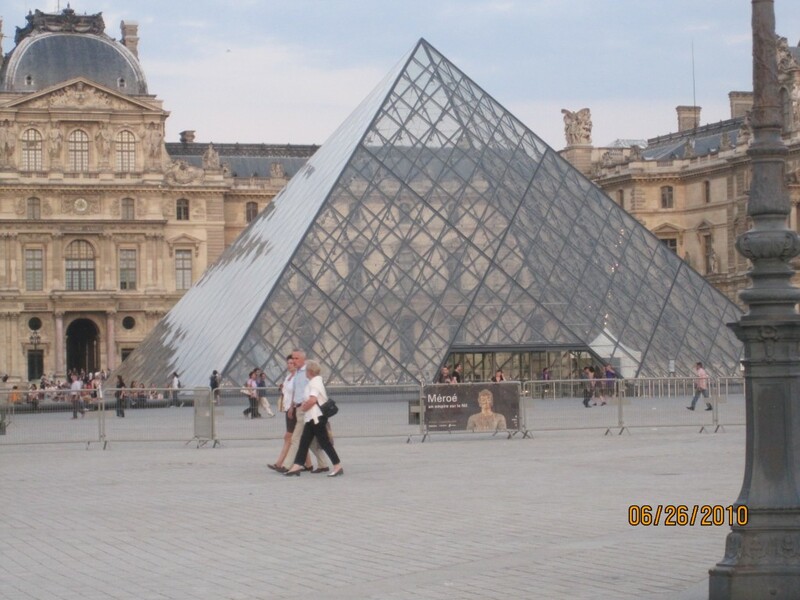 . .
Adventures in Paris III: Shopping! No trip to Paris would be complete with out shopping. Yes, we made it to the obvious – Chanel, Louis Vuitton, Yves Saint Laurent, Anne Fontaine and the like, and they’are absolutely beautiful stores with fabulous merchandise to be had. 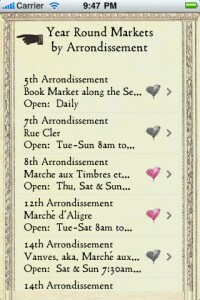 But, I have to tell you my most favorite place to shop in Paris is Marché aux Puces St-Ouen de Clignancourt, a.k.a. the Flea Market! Call me crazy, if you will, but once you’ve been there you’ll know why I love it. For some reason, we don’t have flea markets in the U.S. like they do in Paris or even London for that matter. Leave it to the French to one-up us on junk, but they do and they do it sooooooo well. Whatever your heart desires is there for the taking and then some. A Birkin bag? A Kelly? Vintage Pucci, Channel, Cacharel? 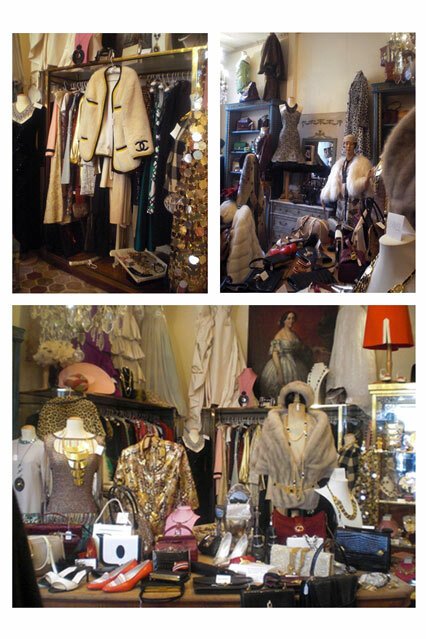 Beautiful costume jewelry, fabulous fur coats, fantastic furniture to outfit every room in my imaginary country home; you name it, and it was there. Prices were pretty good. 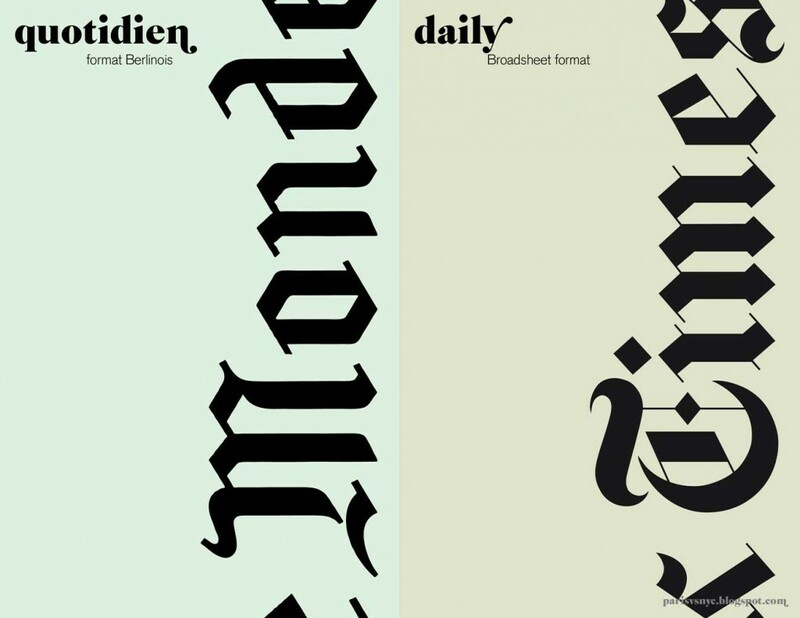 I found that speaking French and exhibiting my knowledge about a particular designer was helpful in dealing with vendors. While we were strolling through the Marché (and there’s lots and lots and lots to stroll through), I saw an Asian woman who’s face was so familiar to me that I began racking my brain to figure out how I knew her (I’ve been in Europe and randomly bumped into friends before, so I really thought this was no different). Then I heard her voice. Her voice was so distinctive that I had to chuckle to myself. It was Vera Wang. Yes, Vera Wang and her husband were spending the afternoon shopping in Clignancourt. But I digress. There are not enough hours in a day for me to explore all that Clignancourt has to offer, but you best believe I tried my best! If I lived in Paris, I would be there every weekend for a few hours exploring, learning and building relationships with vendors (the Marché is only open on Saturdays, Sundays and Mondays). My most wonderful find? Une autre Brazil! (Another Brazil). This one is carmel colored instead of Black, but she’s just as versatile. 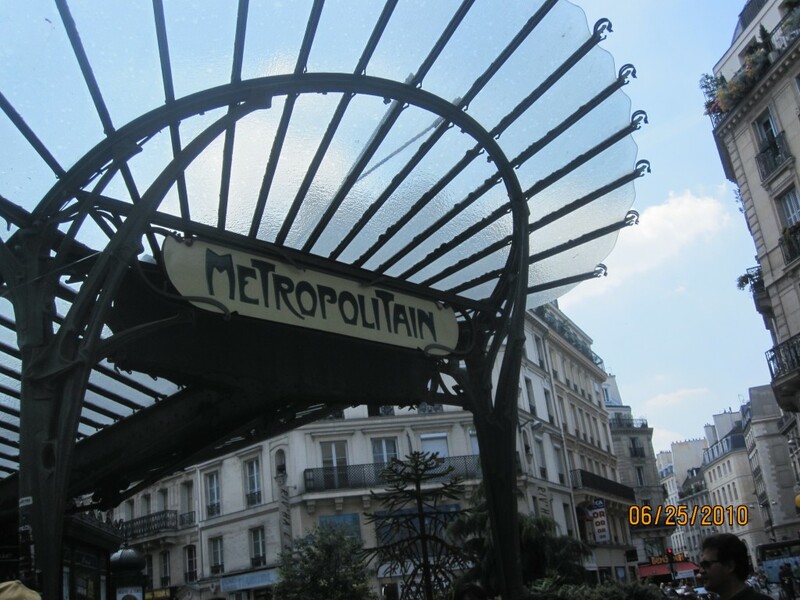 I have wonderful visual memories of Clignancourt, but I have to admit I was sooooooo excited to be there again that I forgot to take pictures. I meant to. I really really did. But I didn’t. Yes, my camera was in my bag. I just got caught up in the moment. You’ll have to go for yourself and experience the thrill that is Clignancourt! Enjoy these pictures courtesy of Vogue.com. And when you go to make sure you find everything you’re looking for, take Keys to the Fleas with you. 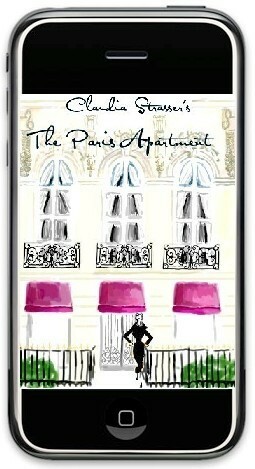 Keys to the Fleas is a new iPhone App launched by Claudia Strasser, the voice behind The Paris Apartment. The app is $1.99 and is an insider’s guide for navigating the Paris flea markets – it includes maps, shippers, Métro stops, bus routes, hours and local haunts where you can kick back and admire your treasures over a café au lait! 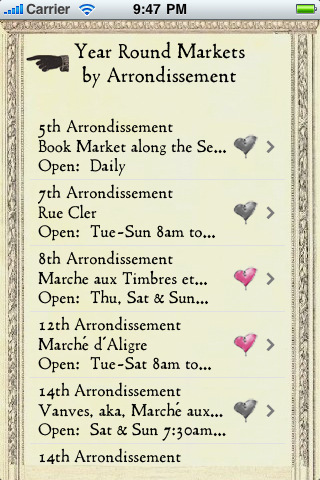 I didn’t get to use the app because it launched a few weeks after we got back, but you best believe I’ll have it with me the next time I go to Paris! 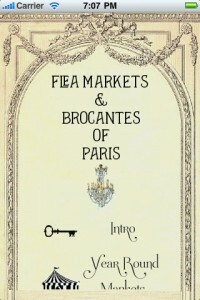 (Oh, and by the way, it’s the first in a series of guides on the flea markets of the world – Morocco here I come!). One more installment from my Adventures in Paris will hit your inboxes with pictures of some of my favorite places and things . . . À bientôt! 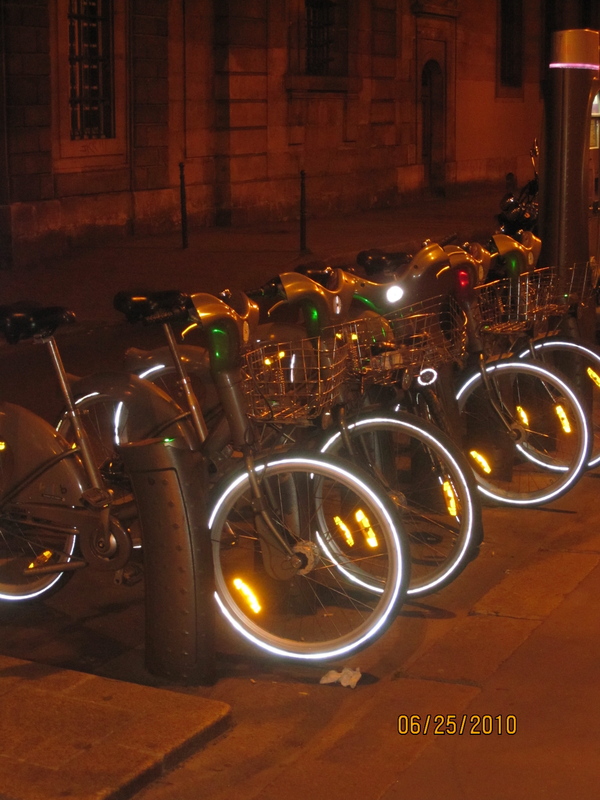 Another reason to move to Paris? 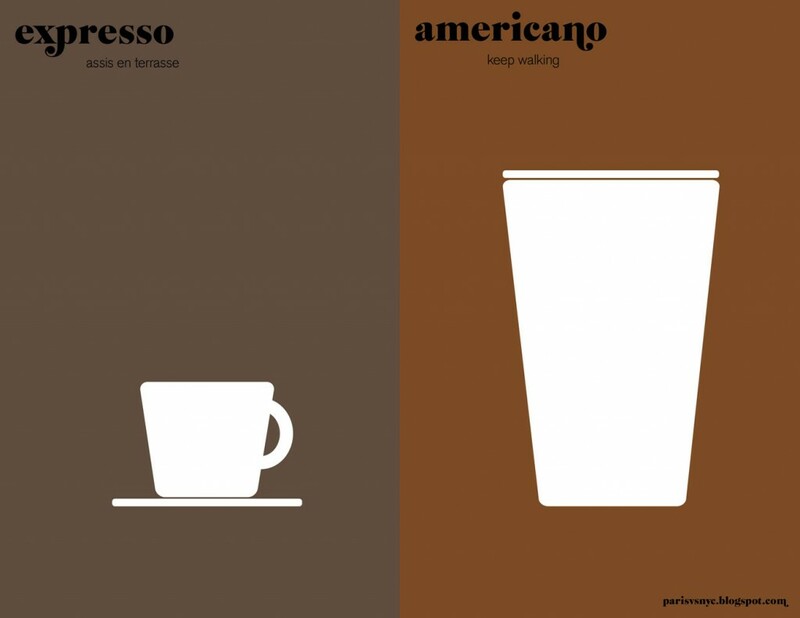 The Cafés! Some of my most relaxing afternoons have been spent sitting in a cafe watching the world go by. I can’t wait for warm weather in New York when restaurants spill over into the sidewalks and you can sit outside to enjoy your newspaper and a good cup of coffee. In Paris, that good cup of coffee is accompanied by a buttery, flakey, melt-in-your mouth croissant. But the real difference is that in Paris, all of the café chairs face the street rather than one another. Why? All the better to see and be seen of course! 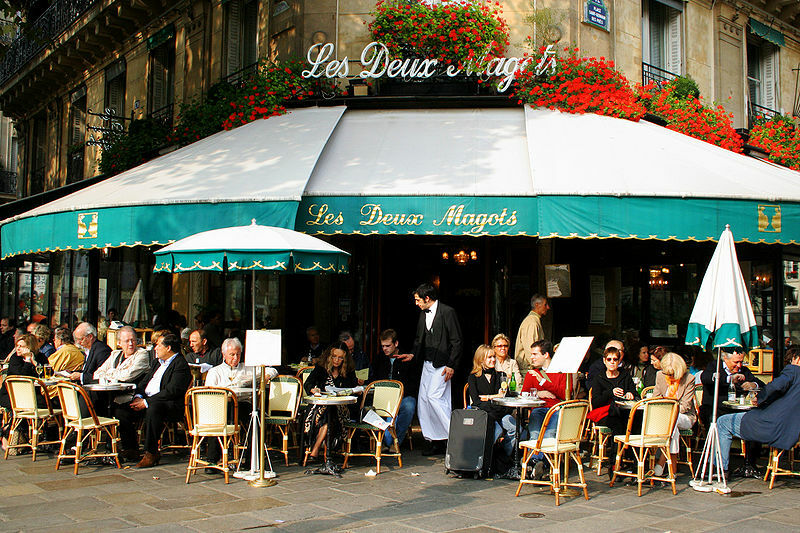 I think my favorite cafe in Paris is Les Deux Magots in Saint Germain des Prés; I know it’s got a reputation for being a bit touristy, but real Parisians really do go there – it’s where our friend Eun Hwa suggested we meet up. The name, Les Deux Magot, comes from the two wooden statues of Chinese commercial agents (magots) that adorn one of the pillars. The last time I was there was almost 10 years ago, but nothing’s changed. The only difference is that then it was a cold March day and my sister and I were doing our best to keep warm while drinking their famed hot chocolate and trying not to look like tourists. This time around, it was 80 degrees and I was drinking Perrier and sitting with Parisians! Summer, Spring, Winter or Fall – it’s a scene. It’s definitely a place to see and be seen from back in the day when intellectuals like Simone de Beauvoir and Jean-Paul Sartre intellectualized and writers like Albert Camus and Ernest Hemingway thought deep thoughts and artists like Pablo Picasso soaked up the landscape. 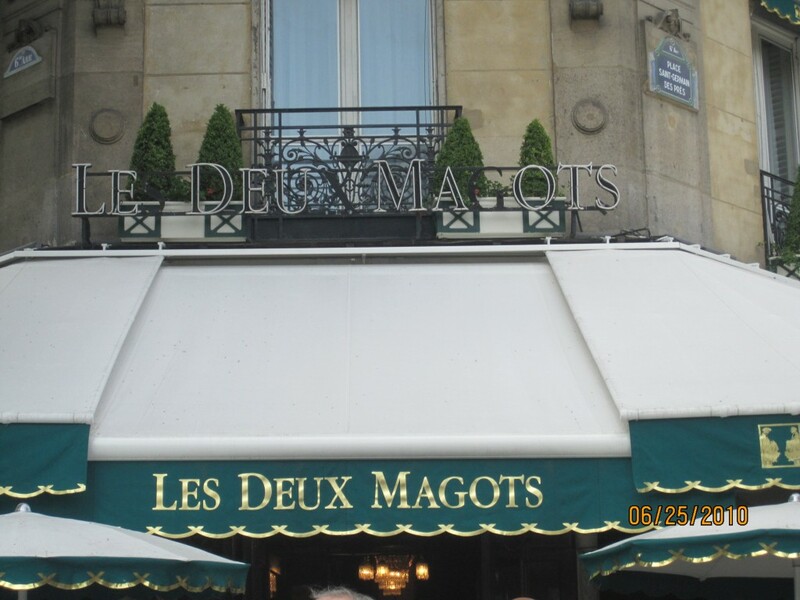 If the walls at Les Deux Magots could talk, oh what stories they’d tell! 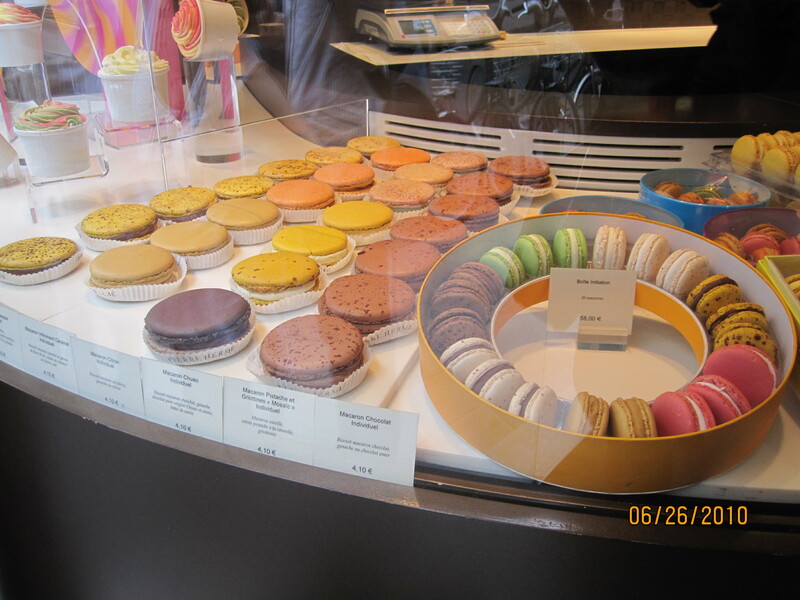 Adventures in Paris, Part I: Vivre Le Macaron! Published on July 14, 2010 in Paris and Travel. 4 Comments Tags: gift, Gossip Girl, laduree, macaron, Paris, pierre herme. 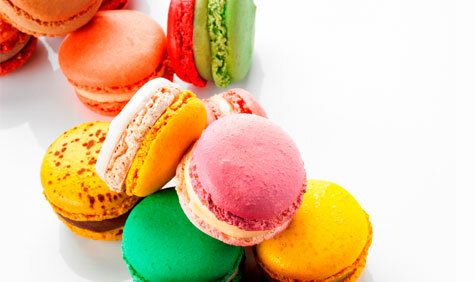 I’ve always liked French macarons, but now I’m a bit obsessed with them. 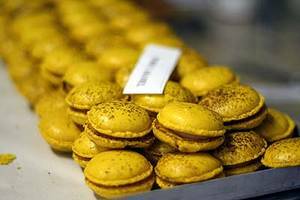 The French macaron differs from what we traditionally think of as macaroons; they are very light sandwich like cookies filled with cream or butter and can be found in a wide variety of flavors. I love the way they taste, but I’m a sucker for how visually appealing they are too. So, we get to Paris and on my list of things to eat/drink are a Cafe Creme, a Croque Madame and macarons. On Day 2 while having my second Croque Madame (I was hellbent on finding the best one in the city) at a bistro recommended to us by our concierge (it was just ok, so the bistro shall remain nameless), people kept walking by with little white bags that said Pierre Hermé on them. 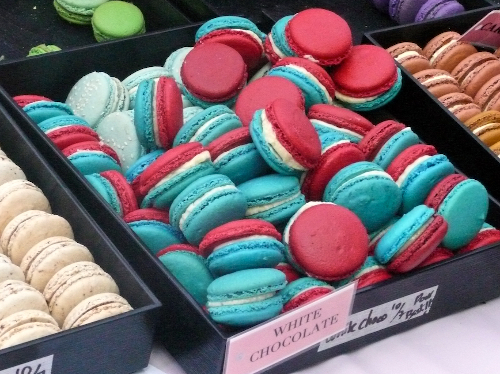 Inevitably, as they walked past our table, they began pulling out the most scrumptious looking macarons. Disappointing Croque Madame No. 2 finished, we exit the bistro in search of this Pierre Hermé. 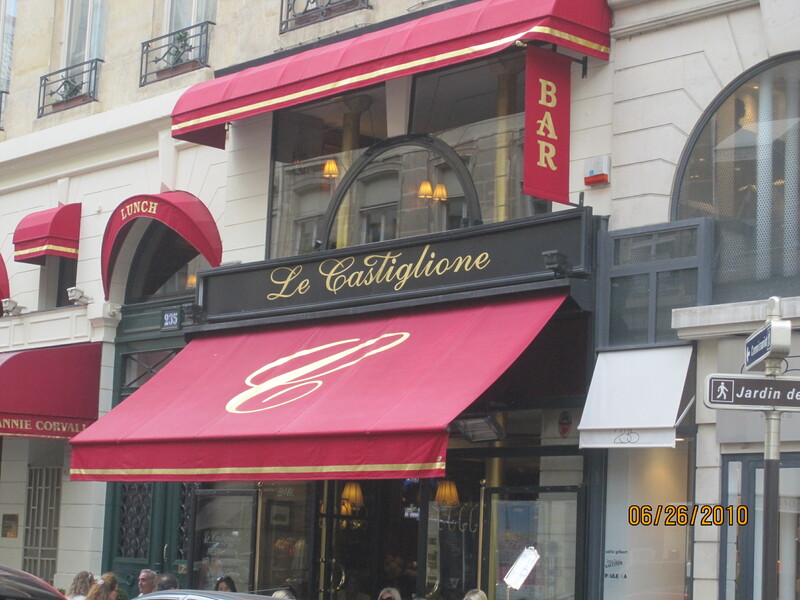 It was literally two doors away from us at 185 Rue de Vaugirard. (In case it’s not obvious, we kind of ate our way through Paris . . . I mean come on, it’s Paris! Great wine and fantastic food, the word diet became a 4-letter word). 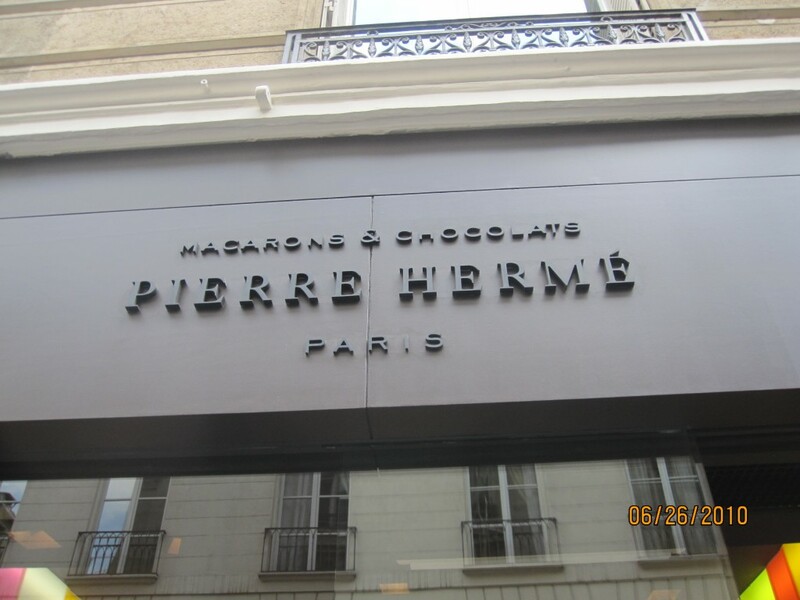 LUXE lists Pierre Hermé as one of their standout stores, they describe it as “mmmelt-in-the-mmmouth mmmacarons” and they were right! It was melt in your mouth deliciousness that just made me want to move to Paris right then and there, but at about 225 calories a pop I probably need to keep my behind right in New York where temptation isn’t around every corner. Caloric count in check, my macaron hunt sated, I was good. That is until the next day when our friends Eun Hwa and Olivier took us to their favorite patisserie in St. Germain de Prés, Gérard Mulot. We couldn’t be rude, right? Who cares if each macaron is 225 calories?!!?! Each was 225 sumputous calories of some of the best confections I’ve ever had. And, I mean you only live once, right? Eun Hwa filled up a lovely gift box for us to take home on the plane. Finger. Lickin’. Good! Now, we did not make it to Ladurée, which has a reputation as being the best macaron shop in the world. 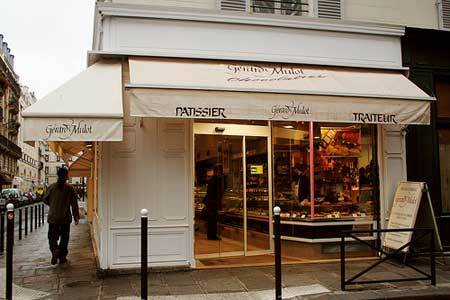 On my next trip to Paris, I will have to make it by to sample their delights. 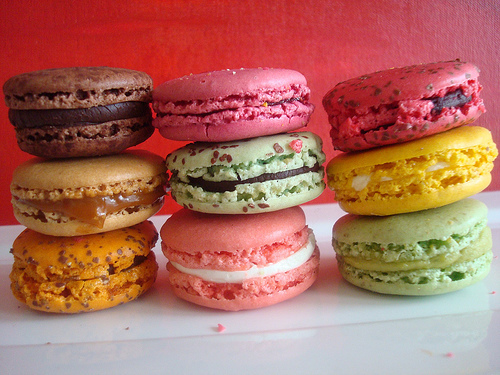 For the time being, I’m still savoring the memory of the macarons we had. My favorite flavor was caramel with sea salt. To. DIE. For. Don’t ‘cha want one right now? . . .
P.S. 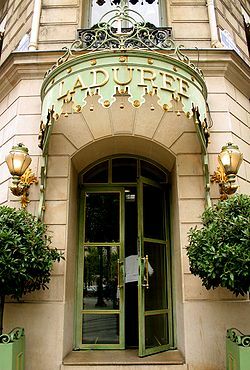 If you watch Gossip Girl, which I do not, look for Ladurée to make an appearance this Fall when the girls from The Constance Billard School for Girls head to Paris. I’m feeling a little Frenchy since my trip to Paris a few weeks ago. The Francophile in me is definitely re-surging! I have loads to tell you about my time in the City of Lights and what better way to kick off my Paris story than to wish my newly adopted countrymen and women Bonne Bastille! 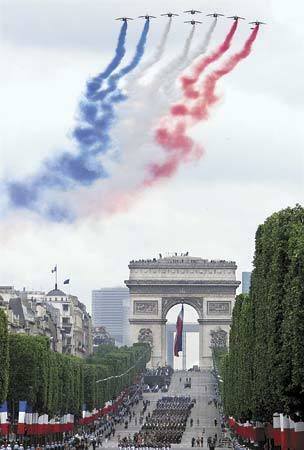 July 14th is Bastille Day in France. Bastille Day commemorates the storming of the Bastille fortress-prision on July 14, 1789 when the French overthrew the monarchy and created their own democracy. Festivities are held on the Champs-Élysées (which I think must be one of the best streets to shop on in the world!) in Paris. So stay tuned . . .
P.S. 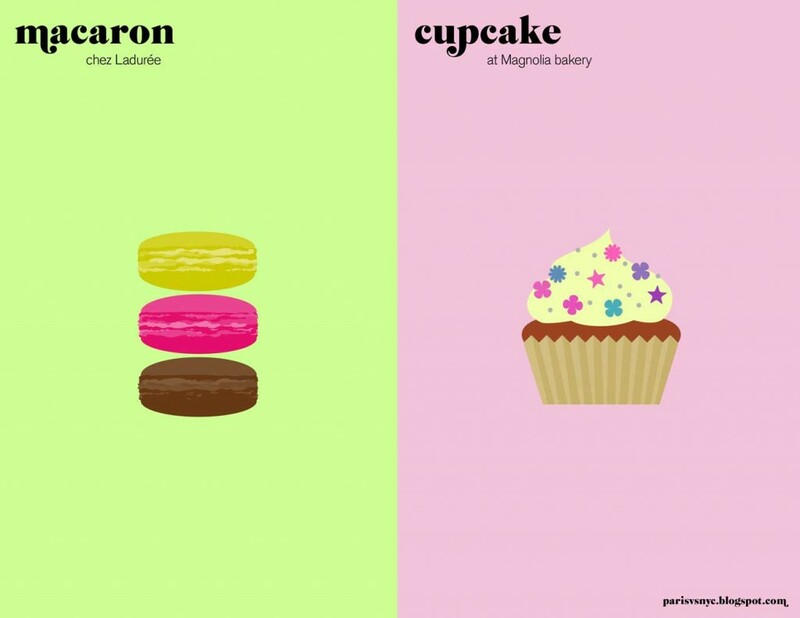 - Oh, and by the way, it’s official, I am a macaron junkie.